Caution - Removing the top cover without properly powering down the server and disconnecting the AC power cords from the power supplies will result in a chassis intrusion switch failure. This failure causes the server to be immediately powered off. Any changes you make to the memory riser or DIMM configurations will not be properly reflected in the service processor's inventory until you replace the top cover. Ensure that the AC power cords are disconnected from the server power supplies. 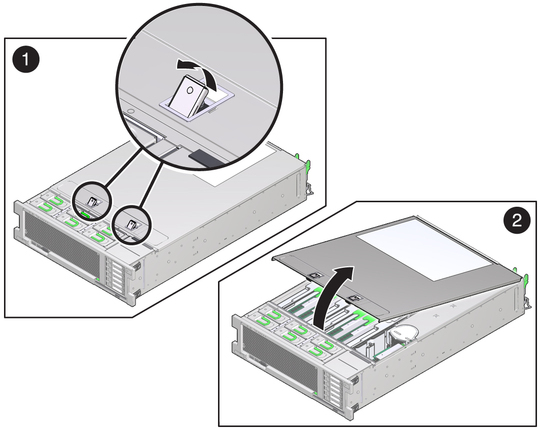 To unlatch the server top cover, insert your fingers under the two cover latches and simultaneously lift both latches in an upward motion as shown in panel 1 of the following figure. Lift the cover slightly and slide it toward the front of the server chassis about 0.5 inch (12 mm). Lift up and remove the top cover as shown in panel 2 of the preceding figure.